When The Raid and The Raid 2 hit theaters, Gareth Evans was a name only a few recognized. Now, following the complete and utter success of those two films, Evans is a household name that is sought out by many projects. 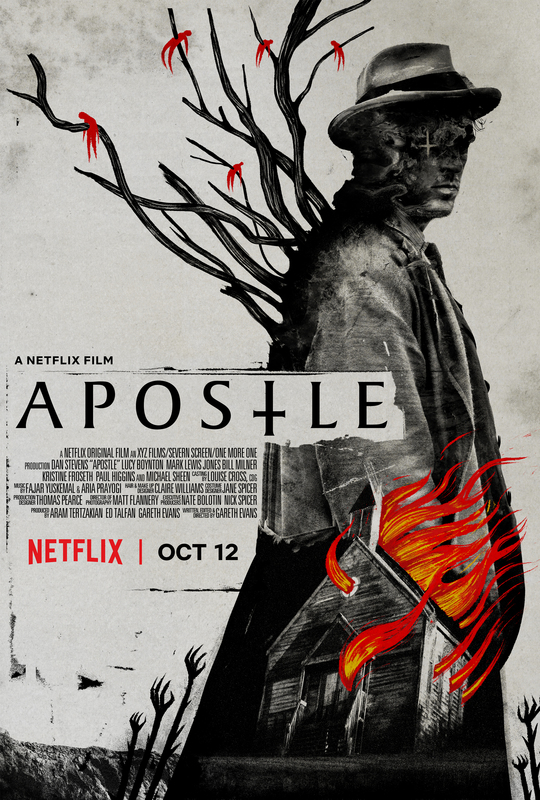 Directly after The Raid 2, the director set his sights on Apostle, an original story that was written by himself and picked up by Netflix. It follows a man (Dan Stevens) as he tries to rescue his sister from a religious cult after learning she’s being held by ransom. Get your first look at the brand new poster below. I am extremely interested in this film. Evans is one of the hottest working directors today, but the main reason why this project is so tantalizing is how different it is from his time on The Raid movies. Sure, there may be a few “action” moments in the story, but this is a completely different story with a completely different tone. And with everything going on in the world today, the setting and time period is a damn near perfect choice for this kind of storytelling. As for the poster, it’s beautiful. This film has sounded dark from the very beginning, and this brand new poster without a doubt captures that. Having never seen a trailer, I’m just as excited to see this movie after the poster as I would be after seeing a trailer. I can’t wait to see yet another Gareth Evans idea come to life. Apostle is set to be released on Netflix on October 12th.